All You & Walmart have joined forces on a special gift card offer!! 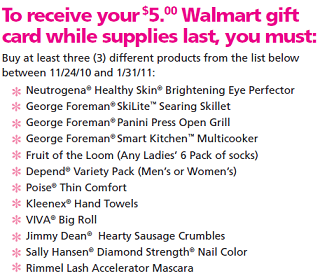 Simply purchase 3 different products from the list below before 1/31/11 and you’ll qualify to receive a $5 Walmart gift card. Print this rebate form and be sure to submit it before the 2/14/11 deadline. I already know that my 3 items are going to be the Fruit of the Loom, VIVA Big Roll, and probably the Jimmy Dean sausage crumbles. This is going to be an easy way to get $5 bucks! Every $ helps around my house!! !